This is the album I wanted instead of Graham Nash’s Songs for Beginners, but after returning it twice because the batch of After the Gold Rush that was in stock at the time skipped, I went home with Graham instead. I think I stated this when we were in the Ns, that I like Graham Nash much better than Neil Young, however this is the far superior record. I’ve been surprised and pleased that there have been so many additions to the Ram alternative list during this last part of my album collection, but I had no hope that this would make it. And I was right. It’s good music. 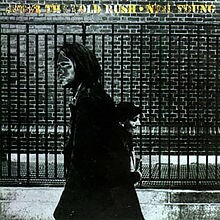 Neil Young certainly does have a style of his own and he seems to write what strikes him at the time. It’s just not a workout album. Not to say it won’t come out again. Even though it doesn’t include my favorite Neil Young songs “Mr. Soul” from his Buffalo Springfield days and “Cinnamon Girl,” it is something that I would like to hear again.